This is a quote from Shakespeare’s Romeo and Juliet. I’m not going to pretend that I have read a lot of Shakespeare, but of the little I HAVE read this is one of my favorite parts. We will get back to Romeo and Juliet in a moment. We have now come to the slow movement of the sonata in D Major, Op. 10 No. 3. Beethoven gives the pianist the instruction that it is Largo e mesto, which means broad (slow) and sad. And sad it is. In fact, I think this music reaches a tragic pathos that is stronger than perhaps anything else Beethoven ever wrote. Maybe an exception would be the slow movement of the Hammarklavier, but I’m not certain. What do all these movements have in common? They are all in a Major key. Even in sonatas in a Minor key. I can’t tell you the immense atmosphere this brings to a concert hall when you play it. It’s so beautiful and tragic a the same time. It’s like a tradegy (as in theatre) in music, and this is the moment when I bring back Romeo and Juliet. At the end in this play, there is scene in a tomb. The background is that to escape being forced to marry someone else than Romeo, Juliet has taken a drug that will make her seem like dead for “two and forty hours”. She has sent a message to Romeo that she will wake up but he does not get it. Arriving at her tomb, he sees her laying dead, and after killing the man she was about to marry (he is there, too) he kills himself. 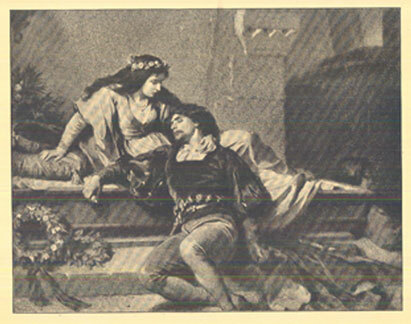 And…then Juliet wakes up, sees that Romeo is dead and…kills herself, this time for real. Why is tragedy such a horrible thing in real life and such a profoundly moving thing in music? Aristotle thought that Tragedy in arts makes us go through a kind of emotional cleansing and that it has a healing effect on us when we get in touch with our own sorrows through the play, or the music. Interesting stuff, and very believable. This movement has some very theatrical movements. One of them comes in the middle of the movement when we have what seems a more relaxed moment but which bursts into a dialog: it is not too far from when Juliet begs for mercy from her father who tells her that Romeo will never, ever be her husband (starts at 0.28). The movement ends with the spirit of hope and light using the little power it has left in a few heartfelt sighs at the top of the piano. But only to be answered by cold darkness which, expectedly, gets the last word. Or the last notes. I have a theory about tragedies that might differ a bit from the one by Aristoteles’ … You see, I believe all emotions are “good” things, seen from the perspective that you feel very much alive when you go through them. The general belief is that life is about avoiding pain and striving for pleasure. When I gave birth to my children, I realized that this is wrong. This moment is connected with two things: deep pain AND the sense of being more alive than ever, and I must say they were the best moments in my life. I believe that we, deep within, want to experience ALL kinds of feelings. But tragedy and sorrow are, of course, still painful and not very pleasant. The theatre tragedy allows us to experience this deep emotion in a “safe” way, and therefore we love it! Because a tragedy at the theatre ALWAYS has a happy ending – no matter how bad it ends in the play, you know that the people are just actors and that they enjoy what they do. If you read it in a book, you know it is just a book (and somewhere a happy writer?). So, this kind of tragedy offers us both the strong, painful feeling, and afterwards we can comfort ourselves: it wasn’t for real! Everybody is happy! Problem solved! Phew! And so we feel enriched by the experience, and enriched is what we want to be. It is the same mechanism that makes us enjoy horror movies, thrillers and roller coaster rides, just as well as comedies and romances. The same thing that makes us being so touched that we weep when we hear beautiful music, and then we say “oh, it was so lovely!” Lovely, to cry? Really? Yes. We simply love to be TOUCHED, deep within. To feel more alive, I think. You really nailed it with your first examples here, when monolog turns to dialog. I read the text a bit sloppy at first, so I just saw the words about monolog. When I then heard the attached music, I thought “nonono, THAT is rather a dialog!” Then I saw what you actually had written. All right. We seem to agree. In the last example, about the ending, I have an alternative interpretation, though. I cannot hear any “spirit and hope” here, what I hear is resignation. Like what you feel when you are in despair and have cried for a long time. Tears are said to be the body’s way of getting rid of some of the chemicals that make us so sad – that is, you cry to feel more relieved, to get rid of some of the unbearable tension within. And so you do, but afterwards you also feel very tired, resigned. You have eased your acute pains, but you are not exactly happy, you are still sad. So, that is what _I_ actually hear in your playing at the end. Now you either do it again to make your point stronger, or we just decide that both interpretations are just fine. 😀 Yes, I vote for the latter. Yes, yes, I agree, I was searching for words there but I would now say “the resignation of Spirit and Hope”! Resignation is the word, indeed! Romain Rolland says in his Beethoven the Creator, and I quote, “Think, for example, of the magnificent Largo e mesto in D minor in the sonata Op. 10, No. 3, — that sovereign meditation that dominates the vast plain of life and its shadows!”. Yes, I think music speaks to us in a language that is much more profound than words and like in tragedy there is the effect of catharsis, in music, I dare say, there is that ineffable feeling that somehow refine our nature to a higher degree of humanity. I played the Large e mesto at my mother’s memorial service. Nobody knew what to say afterwards. She had spent two years dying from ovarian cancer and the piece really captured the sadness and relief I felt at her death. Whenever I listen to this movement I hear the sorrowful, dramatic and ultimately terrifying dialogue between two lovers who are arguing about their relationship – and eventually, coming to the sad, immobilizing conclusion that it should end. I hear confessions … accusations … raising of voices … pleadings for forgiveness … hurt feelings … calming moments of near resolution … feminine cadences arguing with dangerous masculine brooding … frightening near-violent outbursts … more pleadings … more cries … more exposed raw emotions … and ultimately… the sad, regretful, tear-filled decision to end the relationship. I can almost hear them saying “Good bye” in the final measures. Without getting to programmatic, it almost seems like the movement prior indicates the happy beginning of the doomed relationship … and the last two movements represents a rebirth of sorts. A“new start” with someone else.